When the sun rises over the revelers of Nuit Blanche and the first puddles start to appear on the streets of our city, Montrealers come to life with the knowledge that winter is coming to an end. Spring in Montreal is a season of renewal, when the maple syrup flows like water and everyone's eager to get out of their hibernation dens. From urban sugar shacks to experimental jungle parties, here are the best things to do in the city this spring. Now go forth and break free from the shackles of winter! When two of the city’s most infamous street cooks, Beaver Sheppard and Maurin Arellano Frellick, take over celebrated tapas restaurant Sala Rosa to produce a 10-course menu for $45 (cocktail included), you better be there. Fantastic Creatures is a dance show that brings together two very strange performances on one experimental stage. If the terms ‘extra-human worlds’ and ‘objects inhabited by souls’ pique your interest, then this is the place for you. Montreal does things its own way, so it makes sense that for its 375th birthday, the city decided to award itself with... a production of Another Brick in the Wall, an opera based on the lyrics and music of Roger Waters' classic album, The Wall. If one person’s junk is another’s treasure, then the SDAUM (Salon du disque et des arts underground) must surely be everyone’s version of paradise. You may have to wade through a lot of random things to find the zine of your choice, but if it exists anywhere in Montreal’s alternative art space, chances are you’ll find it at the SDAUM. Cabané Sucre is the celebration of the beginning of spring in Quebec, and it’s all about -- you guessed it -- maple syrup. Though there’s no shortage of Cabané Sucres in rural Quebec, where the golden stuff just comes pouring out of the trees, it’s much harder to find a good one within the confines of Montreal. This year, SIROP: Cabane Urbaine is going to give this a try with an environmentally minded, urban sugar shack, and we’re going to be there to drown our sorrows... in gallons of syrups. Magnus Nilsson -- of famed restaurant Fäviken in the far reaches of Northern Sweden (and the PBS documentary The Mind of a Chef) -- is coming to Montreal for an honest conversation about the evolution of Nordic cuisine, and his own journey into something that is at once so cerebral and so personal. Tickets are flying like hotcakes, so get yours ASAP. Revolution They Wrote is a four-day event that aims to present new provocative, inspirational, and educational feminist works to an audience that ranges from your best friend to your angry neighbour. Some of the works will get you thinking, while others will likely just have you scratching your head in confusion. Though entry to this cocktail dinner comes with a stiff price tag, any self-described foodie will fawn over the list of names whose creations will be on offer this evening: from the famed food of Toqué! and Joe Beef, to the market-driven plates of Provisions, Le Vin Papillon, and Tuck Shop, all served aside wines of Oenopole and cocktails from Loïc. You can also rest assured that all proceeds will go towards a good cause -- the Salmon Foundation, which works for the protection of Quebec’s salmon population. David Sedaris is an American autobiographical short-story darling whose work is as known for its wry, self-deprecating humour as for the uncompromising lens it takes to the American suburban family -- with all of its skeletons in the closet. Always dreamed about learning the basics of blues dancing? How about munching on an all-you-can-eat bagel buffet while you’re at it? Whether you’re a blues novice or an expert dancer, there is something for everyone who appreciates this old-timey genre at the four-day extravaganza that is Bagel N Blues. The Montreal Contemporary Art museum has been slowly turning itself into a fun nightspot for Montreal’s hippest crowd, and Jangala is just the latest event in this transformation. Few details are available yet about an event that promises to herald the spring and bring together pristine nature with technology, but we are sure it’s going to be mind-boggling. Zadie Smith is one of the literary giants of our days, and her arrival in Montreal has everyone on the edges of their seats. A ticket to her talk gets you a copy of her new book, Swing Time, and a chance to hear her speak in the beautiful setting of the Rialto Theatre. Do you know those restaurants that make you feel so welcomed, it’s as though you’re sitting at the chef’s own dinner table? Well, Restaurant Day takes that concept and lets anyone become a chef for a day by inviting people to share a meal at those famed dinner tables. Seating is limited, the menus are diverse, and the prices vary, so choose your adventure wisely! When a business conference becomes the hottest ticket in the city, you know it’s not your average corporate event. 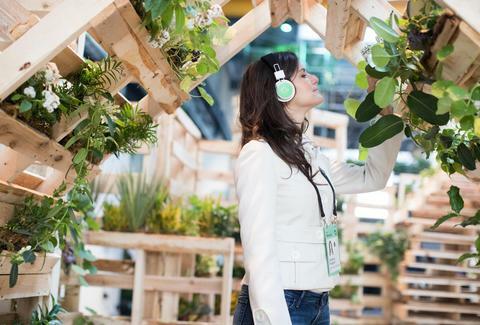 From augmented reality to floating inside giant balls or swinging 20ft up in the air, the guests at C2 Montreal discover much more than just the newest trends at marketing and commerce. C2 is intentionally designed to spark your creativity and get you thinking in entirely different ways, and every year, it blows the competition out of the water. Kick-off summer with artisanal popsicles at POPS ART! Tucked away in a small residential courtyard just steps away from the Lachine Canal waterfront, POPS ART! is a St. Henri-based popsicle store that has been making waves around the city with its unique flavours and colourful, Mexican-inspired design. Each year it throws a huge bash for its anniversary, and this year -- its third one -- will be no different. Go and see what a corn popsicle tastes like, we dare ya. Ksenia Prints is a freelance writer and food blogger, photographer, and recipe developer for At the Immigrant's Table who loves exploring Montreal’s dining scene. Follow her exploits in the kitchen and beyond at @immigrantstable.